I hope I’ve got your attention with that provocative question; do you suffer from FONKU? In case you’re interested enough to read to on, FONKU is an acronym for ‘Fear Of Not Keeping Up’. I believe that there’s plenty of female bike riders that suffer from FONKU and it’s holding us back. I actually include myself in that cohort. So I made up my own term for it. 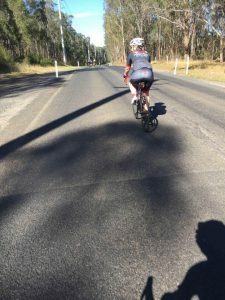 I sometimes go out for group rides and decide that I won’t be able to keep up even before I leave home, and I often hear similar laments from other female riders. The worst part of this negative thinking is that it often comes true and it’s not always because of my ability, but more to do with my attitude. So what can we do about it? Here’s a few of my tips for combating FONKU. That voice inside your head has a huge impact on your life. Use your quiet time to focus on the sort of things you say to yourself, and practice changing it to positive statements. One of my favourite phrases I say to others who are struggling mentally is ‘Be Kind to Yourself’, but I’m not always great at practising it myself. “I will keep up”, “I will keep up”. I’m not a very athletic person so I know that in order to keep up with my more athletic counterparts, I need to ride more. The expression that ‘you need more Ks in your legs’ definitely applies to me. The more I ride, the easier I can keep up with other riders. 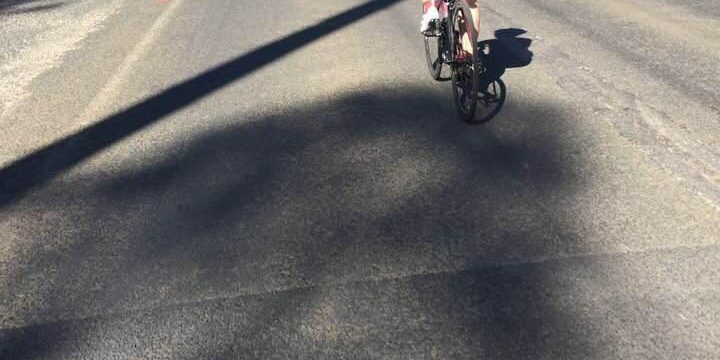 If you really are riding with people who are always going to be faster than you, no matter how much you train, then maybe you need to find another group to ride with. Although it may be, that you will be able to keep up over time, so don’t give up on that group that’s just a little faster than you believe you can ride. As your fitness improves you will be able to hang on for longer. For some group rides there might be the option of taking some shortcuts so you can rejoin the group. You could utilise those shortcuts for the period of time until you have increased your speed and can keep up for the entire ride. Attend a skills workshop or hire a coach so you can improve your riding skills. You’ll go faster if you corner correctly, descend well, pedal efficiently and get the most out of your equipment. And if you can’t find an actual workshop there’s some great books and online resources like this blog where you can learn about skills. Then practice, practice, practice. Do you suffer from FONKU? How do you combat it? Share via comments or the Women Who Cycle Facebook page. Great acronym – I knew straight away what you were talking about! I think another “fear of” that stops me riding with bunches at times, is that I’ll be slow and that someone might feel the need to wait or go slow to stay with me; but it’s usually all in my head. Great blog! As someone who leads group rides and tours I see this too often. Thank you for the tips I will use some of these! Yeah…. I tend to frequent “no drop” rides, unless I know either the group or the trails. And yet…. I truly do not not waiting on a slower rider when the shoe is on the other foot.